A new year warrant something new to “shake” up your world. 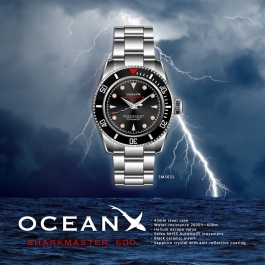 The OceanX Sharkmaster600 “ThunderBolt”. The seconds hand is boldly replaced with the iconic Lightening Bolt hand. 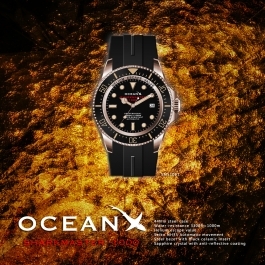 Remained faithful the watch is water resistance to 100 fathoms. The extra domed crystal brings out the old school feel to the watch. The 43mm case is good for everyday use and the helium escape valve at 9 o’clock is installed for professional use. 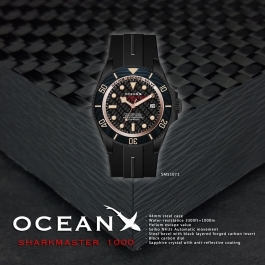 The Black Soul with iconic snowflake hands - OceanX launches the all new - Black Soul Sharkmaster 1000 limited edition. The “triple black” treatment is deployed for each Black Soul. This include a black DLC coated stainless steel case, a weaved multi-layered carbon fiber insert bezel. Last but not least a durable high quality black rubber strap. Perfect for those late night mission at the office. Limited to 125 pieces. Hurry whilst stocks last. Glass: Blue sapphire crystal with antireflective application. Case size: 44mm wide (excluding the crown), 17mm thick, 47mm lug-to-lug distance. If you are like us enduring the cold weather and dreaming of a more forgiving warmer climate then why not indulge yourself to something California? 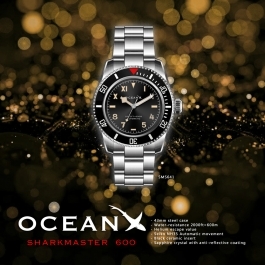 The OceanX Sharkmaster 600 “California” feature the popular California dial and the iconic snowflake hands. 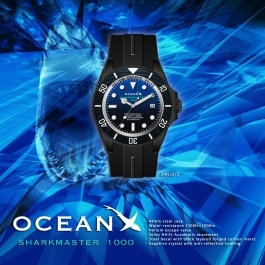 Remained faithful the watch is water resistance to 100 fathoms. The extra domed crystal brings out the old school feel to the watch. The 43mm case is good for everyday use and the helium escape valve at 9 o’clock is installed for professional use. 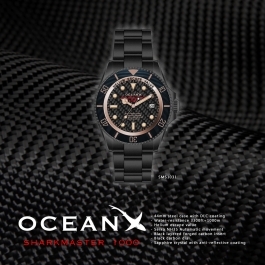 The Black Soul - OceanX launches the all new - Black Soul Sharkmaster 1000 limited edition. Back in stock by popular demand! 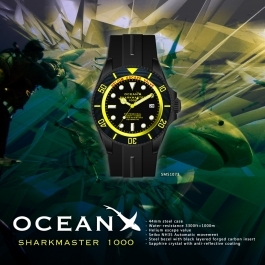 OceanX Sharkmaster 1000 - SMS1061 and other models are now back in stock. If you are keen to get your hands on one please enquire with your local dealer as soon as possible as the numbers are limited. Fancy adding some icy feel to your winter season. 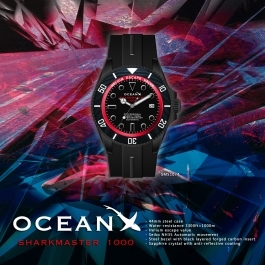 OceanX is proud to present our Christmas edition of the popular Sharkmaster 1000m. The watch (aka “Frozone”) will feature an ice blue sunburst dial and a coffee brown ceramic bezel on our standard surgical grade stainless steel case. 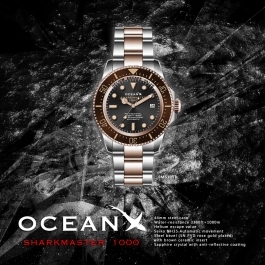 The all new OceanX - Sharkmaster GMT II is equipped with a separate 24 hour hand and a 24 hour bi-directional bezel, enabling it to track the time in upto 3 different locations. Perfect for the frequent traveler. 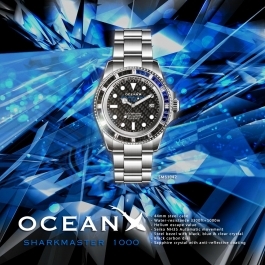 Without losing it heritage the Sharkmaster GMT II is water resistant to upto 200m. The full stainless steel case is 42mm in diameter and the solid steel bracelet is 20mm in width. The dial is protected by sapphire crystal. Powered by the high precision Swiss Ronda quartz movement. Soon to be available to you at a stunningly attractive price. 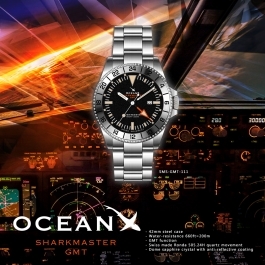 The all new OceanX - Sharkmaster GMT is equipped with a separate 24 hour hand and a 24 hour bi-directional bezel, enabling it to track the time in upto 3 different locations. Perfect for the frequent traveler. 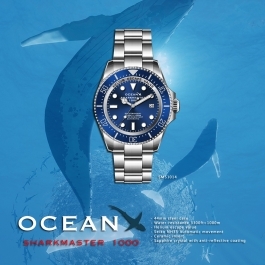 Without losing it heritage the Sharkmaster GMT is water resistant to upto 200m. 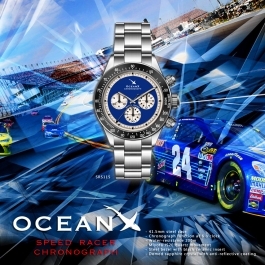 The New OceanX - Speed Racer Chronograph - SRS115, designed as a tribute to professional racers. The watch is strong in character as those elements of high performance racing world. Limited edition 70 pieces. 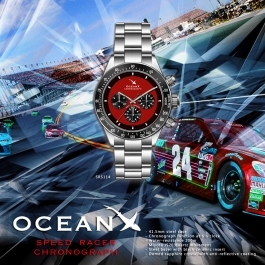 The New OceanX - Speed Racer Chronograph, designed as a tribute to professional racers. The watch is strong in character as those elements of high performance racing world. A 41.5 mm stainless steel case, complement with an extremely durable black ceramic tachymetric scale outer ring. The Speed Racer is equipped with high precision Japan quartz movement, sapphire crystal and a 20mm solid steel bracelet. The Speed Racer will be retailed at an attractive initial offering price. We continue to look for exciting colour and materials to bring to our customer eye popping looks and avant-garde materials at affordable prices. Case measurement 44mm in diameter (excluding crown) 17mm thickness. Brushed finishing steel bracelet (5N PVD rose gold plated). Water resistance to 1000 meter (standard helium escape valve). Steel bezel (5N PVD rose gold plated) with brown ceramic insert. Blue sapphire crystal glass with inner anti reflective application. The 2018 winter edition Sharkmaster 1000 feature 24 black, 12 blue and 12 clear baguette crystal. The glittering bezel is a cool winter wear. 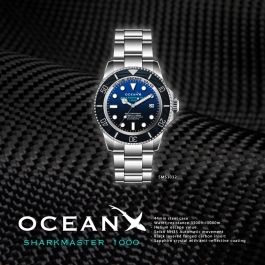 The brand new OceanX Sharkmaster 600 is water resistance to 100 fathoms. This is one cool vintage looking gear to hit the beach this summer. The extra domed crystal bring out the old school feel to the watch. The 43mm case is good for everyday use and the Helium escape valve is installed for professional use. 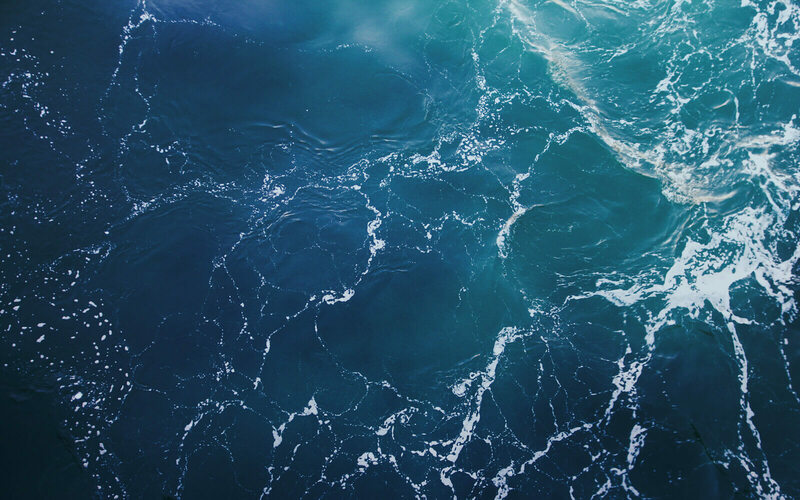 A summer limited edition brought to you by the OceanX team. 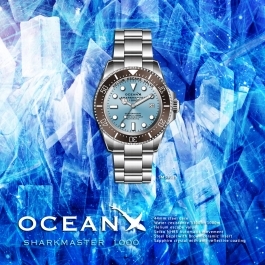 The 2018 summer edition Sharkmaster 1000 feature 24 red, 12 blue and 12 clear baguette crystal. The glittering bezel is a cool summer wear. SMS1032 is inspired by Hyper racing machines. To capture the speed and sound of these awesome man-made engineering miracles we decided to go with carbon fiber as our main material. The bezel insert feature a weaver multi layered carbon fiber ring. SMS1031 is inspired by Hyper racing machines. To capture the speed and sound of these awesome man-made engineering miracles we decided to go with carbon fiber as our main material. The dial is made with real carbon fiber. For the case we were experimenting between weaved carbon fiber case but in the end we opted for stainless steel case with Diamond like coating for a better water resistance casing. Last but not least the bezel insert feature a weaver multi layered carbon fiber ring.